Are you sad and totally lacking that feel of approaching winter holidays? The latest issue of our glossy supplement will help you, since it is “charged” with positive emotions, warmth, and wisdom. “Cultivating one’s inner world is worthwhile, I mean doing this purposefully and throughout life. Much can change around one, but one’s inner world will never go away if it is well cared for. The first criterion of it being so is the feeling that one is not bored with oneself... Focusing on what matters to one helps one overcome the difficulties. Having determined clearly that one needs to take care of oneself will help to survive various circumstances,” our editor-in-chief Larysa Ivshyna said as she offered a “recipe for more than one holiday” in her traditional column. Chairman of the Agrarian Party of Ukraine Vitalii Skotsyk spoke about his family traditions of New Year and Christmas celebrations to Route No. 1, while French winemaker and owner of the Adam-Jaeger champagne house Regis Adam talked to us about the subtle features of the indispensable sparkling attribute of the holiday, and founder of the L’Arbre brand Kostiantyn Lisakovskyi described “meaningful adornments.” Meanwhile, general producer and host of the Internet TV channel URKLIFE.TV Liudmyla Nemyria, civic activist and former Kyiv city councilor Olena Terestchenko (Yeskina), owner of Tsukernia Svitlana Roman, as well as a whole constellation of ambassadors, coming from Canada, Germany, Bulgaria, India, Japan, Australia, Georgia, and Turkey, shared the peculiarities of their holiday banquets. 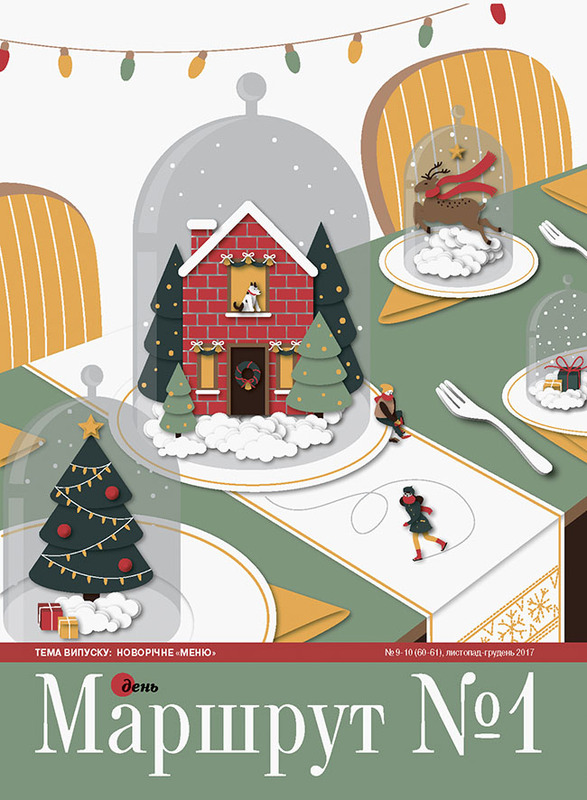 Everyone will definitely find something interesting for themselves in our review section as well, which covers winter music from the radio station Aristocrats, original Christmas decorations, “magic” celebratory dishes and ideas how to give a holiday to those who need it most. By the way, the glossy magazine will please even those who do not like “kitchen activities” at all! Are you already interested? Order Route No. 1: New Year’s Day Menu from the store on Den’s website or by calling the sales department at (044) 303 96 23. Or wait till December 15 to buy it at a newsstand!